Enkel promenad till downtown Paso Robles torget för restauranger, vingårdar och butiker. Detta hem har 2 sovrum, 1 badrum, ett expansivt kök med alla köksartiklar och matställen, matplats, vardagsrum, fullständiga tvättstugor med strykjärn, strykbräda, tvättmaskin och torktumlare, en helt inhägnad gård och mycket mer! Detta hem har ett vackert vardagsrum med en magnifik öppen spis. Bakgården har en uteplats och grill, vilket gör det perfekt för al fresco dining. Det stora sovrummet har en queen size-säng. Det andra sovrummet har en full size-säng. Fullt utrustat kök med både en Keurig kaffebryggare och fransk press. Allt du behöver för en perfekt semester! Utomhusområdet har en uteplats med gasgrill och matbord. Den privata bakgården gör det till en idealisk miljö för att koppla av och njuta av ett glas vin. Gästfaciliteterna inkluderar gratis Wi-Fi, spel, böcker och DVD-filmer. Det finns ingen kabel-TV, men Roku-spelaren har en smart funktion så att du kan använda alla dina favoritappar. Vi har också dedikerade Netflix- och HBO Now-konton och spelaren bör automatiskt logga in för att du ska kunna se alla dina favoriter! Dessutom ingår tvättmöjligheter och privat parkering. Shampoo, tvål, pappersprodukter handdukar och sängkläder tillhandahålls. Detta är en hundvänlig egendom. A $ 35. 00 husdjur avgift gäller. Gästerna måste städa upp efter sina husdjur. Husdjur får inte lämnas obevakad i fastigheter. Detta hem är lättillgängligt för Hwy 101, bara några kvarter från centrala Paso Robles och bara 10 minuter från Templeton centrum. Detta hem ligger inom gångavstånd till många centrala provsmakning rum: LXV Wine Tasting Room, Tudor Vin, Derby Vin Estates Tasting Room, Cypher Winery, Copia Vineyards och Pianetta Winery. Eller gärna utforska de andra 200 + vingårdarna som Paso vin land har att erbjuda! Everything was great! The location is perfect for downtown fun and wineries are just a short drive. 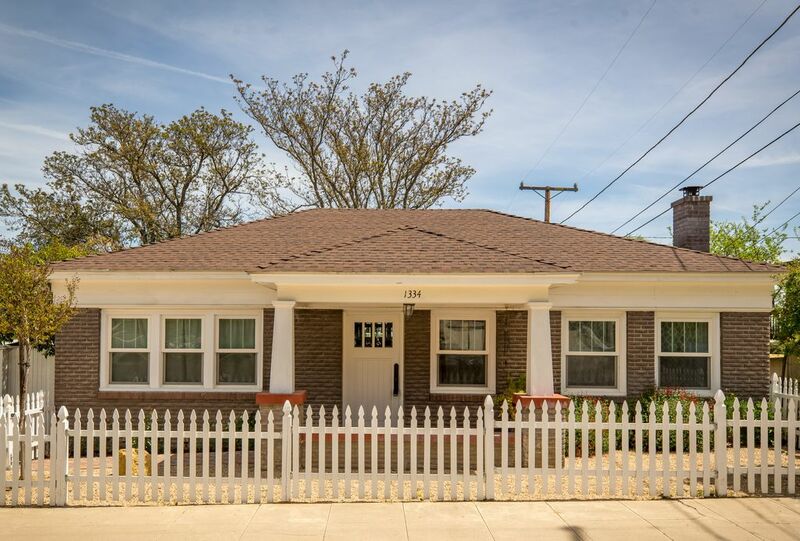 The Craftsman Cottage is in a wonderful neighborhood of mixed historic and newer homes. A few blocks walk to the heart of PR, the downtown square with its many restaurants and shops. The house is well cared for, kitchen very well equipped, comfortable bed. Very nice outdoor seating for al fresco tasting of wines from the wineries we visited each day. We hope to return soon. Very well located. Comfortable, but very small. Loved the location and it was fine for one couple and a doggie. It would be too tight for more people, as both bedrooms Just fit a bed and the one bathroom is small, as well. The kitchen is large and bright. The heating system is quite old and is quite loud. It was clean and well-kept. This was a little get away for us, from San Diego. A new place for us and we were not disappointed. The house had everything we needed. The bed was most comfortable. Loved the small fenced in yard for our two small dogs. The neighborhood is a nice quiet one. There was only one situation, the tree where you park dropped sticky debris on our car's hood. It had to be washed off, the next day. For the rest of our stay, we put a throw over the hood and that seemed to do the trick. We had a great stay... We will be back! The house was very comfortable and well equipped. Rachelle B.Where do you live? The two problems with this property are number one the bathroom sink was clogged.Two,the back door did not close properly. Finally it was difficult to work the heating unit. Other than that it was a comfortable stay.